MJC² is a world-leading provider of logistics planning software for very large transport and logistics businesses. We have supplied logistics optimization solutions and vehicle routing software to some of the largest operations in the world, scheduling 1000s of vehicles and logistics movements in real-time. FAST is a logistics optimization initiative that has resulted from the success of the FLAGSHIP and e-Freight projects, designed to help small businesses and not-for-profit organisations benefit from advanced vehicle routing algorithms. Apart from the cost savings that FAST generates, reduction in greenhouse gas emissions and environmental footprint is another major benefit. 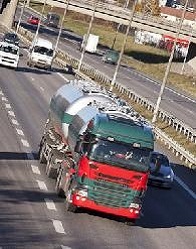 FAST takes as input the list of deliveries (identified by their postcode) and available vehicles/drivers for each day. Based on this information the system automatically allocates the deliveries to the vehicles, aiming to create journeys which minimise the overall driving time and distance while still ensuring that all work is assigned. The resulting plan is displayed on the map and also on an interactive gantt chart. Reports provide detailed schedules and summary of main KPIs. FAST is designed to be easy to use, requiring minimal training, and as the name suggests, it can optimize delivery routes and schedules very quickly. Users of the system have reported very favourable results. Colin Richardson of Northants Sweet Appeal said: "I would rate the performance of the system as excellent ... it not only saved me fuel but also time, both very important in business." FAST provides powerful vehicle routing and scheduling capabilities and is designed to help small operations grow their business and improve efficiency (while also reducing environmental footprint). FAST can be used to schedule deliveries or collections and is ideally suited to small operations distributing goods. Example success stories include furniture delivery, Christmas tree collection (by a charity), automotive distribution and parcel delivery.